Hengistbury Head is a scenic and historic headland near the town of Bournemouth on the south coast of England. It stands mid way between Poole harbour and Hurst spit and forms the main division between Poole and Christchurch Bays. Hengistbury Head incorporates many different habitats and supports a wide variety wildlife and rare plant species. It is also a site of significant archeological importance.For many years it has been a site of scientific interest and a major tourist attraction. Each year it attracts visitors from all over the world. 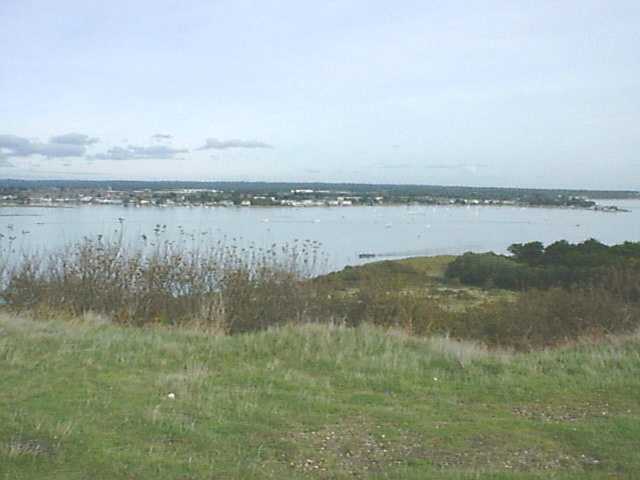 Hengistbury Head is also a major educational resource and is heavily used as the foundation and subject for a range of studies related to local history and the environment. 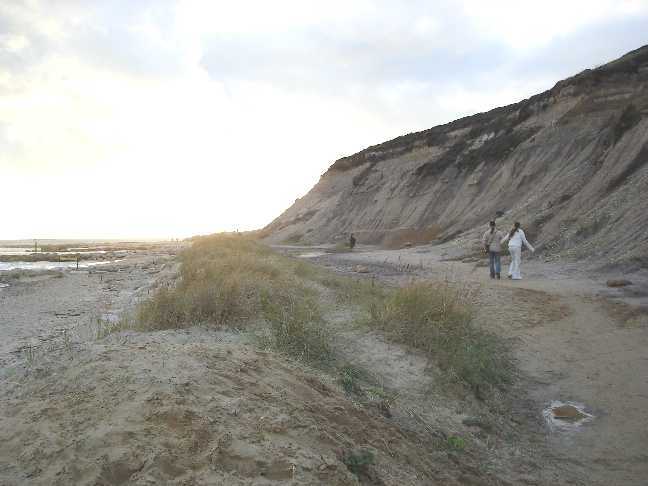 Many visitors to Hengistbury Head enjoy hiking and rambling across its natural, yet accessible terrain. In the Summer the sandy beaches in particular, are a major draw for families. 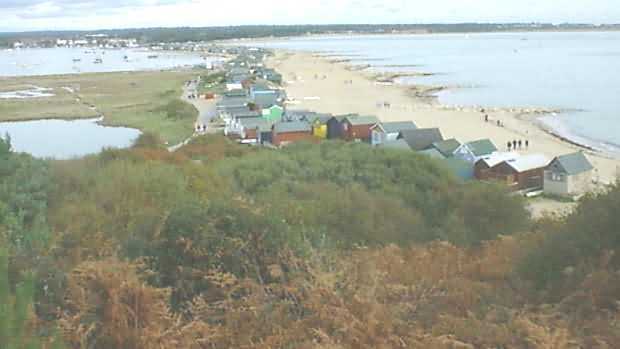 The lowland area to the West of Hengistbury Head is extensively	use for kite flying and is also a popular picnic site. 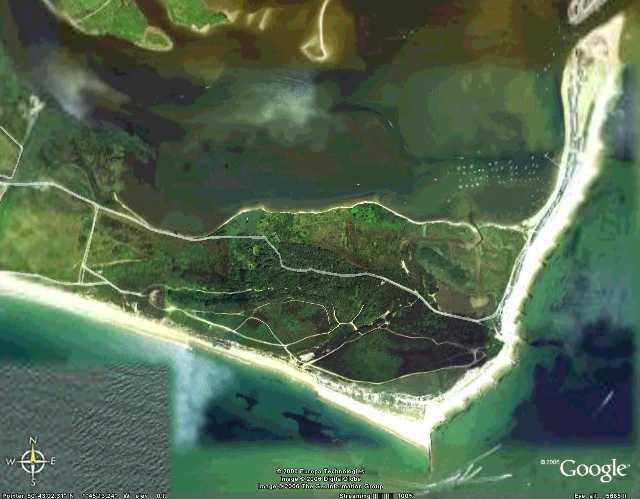 In the Google satellite image below left, notice the harbour-side small bay to the left of Hengistbury Head. This little bay is known as Barn Bight and the land area just south-east of it is known as Barn Field. This is the area some people are concerned about regarding a possible future breach where the sea could overwhelm the low narrow Barn Field area and turn Hengistbury Head into an island. The End of the Long Groyne (bottom right) at the East seaward end of Hengistbury Head extends to approximately where Hengistbury Head beach was in the 1850's, which gives a good idea of how much erosion has taken place. The initial formation of Hengistbury Head dates back approximately 60 million years although newer alluvial (i.e. river) deposits have been laid down as well and the later of these date back less than 10,000 years. 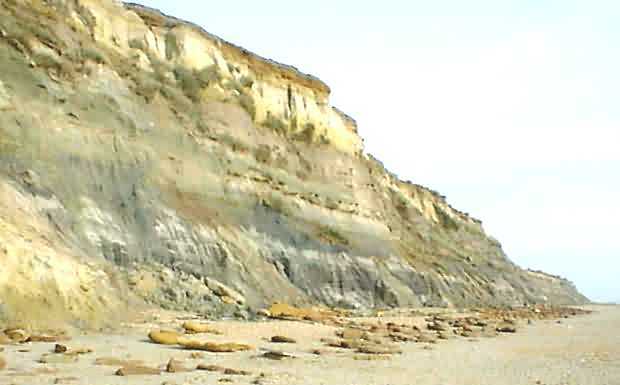 Until comparatively recent geological time Hengistbury Head was several kilometres inland. In the image below on the right, past the Long Groyne at the eastern end of Hengistbury Head is the Isle of Wight, separated from Hengistbury Head by the stretch of sea known as the Solent. Just visible at the far right hand end of the Isle of Wight is the Needles Rocks and Lighthouse. They are easily visible from Hengistbury Head on a clear day. Hengistbury Head forms a natural breakwater protecting a small natural harbour formed in it lee from the prevailing southwesterly wind. A long sand spit has formed trailing off the end of the Head. This sand spit forms the easterly perimeter of Christchurch Harbour. The sand spit is known under several names including Mudeford spit, Mudeford beach and locally as the Island. The image below left: The constantly changing sand spit formed off the eastern end of Hengistbury Head. For a brief period in the 17th century a channel was dug through the spit so vessels could avoid the treacherous natural entrance to Mudeford harbour. But it lasted only a few years before being abandoned. Today the spit hosts a 17th century building known as the Black House (now holiday flats), a cafe and a motley array of beach huts. 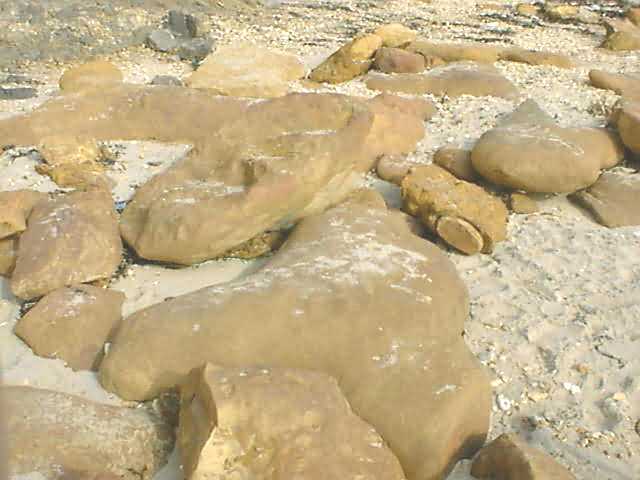 The Ironstone doggers, or boulders, (below right) that protected the base of Hengistbury Head for so long are a strange concretion built up over many thousands of years in a stagnant bog environment. They are very rich in iron, which was one of the primary reasons why they were gathered up and taken away in the 1850's. 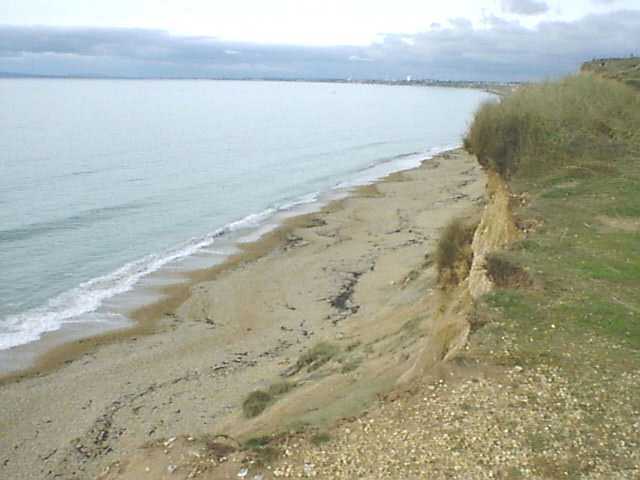 Hengistbury Head had been subject erosion ever since the southerly chalk ridge, which stretched from the Needles in the Isle of Wight to the Old Harry rocks near Studland was breached by the sea. The sea invaded the river valley between the ridge and the Head and rapidly eroded the soft rocks to the south of the Head. This erosion was slowed, if not stopped, by the accumulation of hard iron stone boulders that were left from the erosion of the softer rocks in which they were embedded. The rate of erosion has increased rapidly since the mid 19th century when the Hengistbury Mining Company removed a great deal of the hard iron ore boulders (known as doggers) from the beach. They also dredged many tons of the doggers from the inshore waters around the Head. These doggers had formed a natural defence against the sea and their removal caused a very serious instability in the natural system that had developed and had kept the whole region relatively stable for at least 2000 years. Since the 1930's a great deal of time and effort has been put into rectifying the situation. A lot of money has been spent, mainly by Bournemouth Council in the construction of breakwaters and groynes. While these schemes have generally been successful, almost half of the Head, including one of the original promontories have been lost. The Double Dykes was a ramp and ditch defence built to defend the Iron Age settlement on Hengistbury Head It is probable, that before the massive erosion that took place from the 1850's onward, that the Double Dykes curled round to the east at their southern end. Hengistbury Head formed a natural fortress and was ideally suited as an iron age trading port. Hengistbury Head was arguably the premier port for the import of continental goods such as Italian wine in around 100 BC. Some have referred to it as the first truly urban settlement in England. The influence of the settlement at Hengistbury declined during Roman times and finally ended as they left. Hengistbury Head has not been subject to human habitation for a considerable time although abandoned plans for house building and leisure development did have a significant effect upon the Head during the early part of the 20th century. 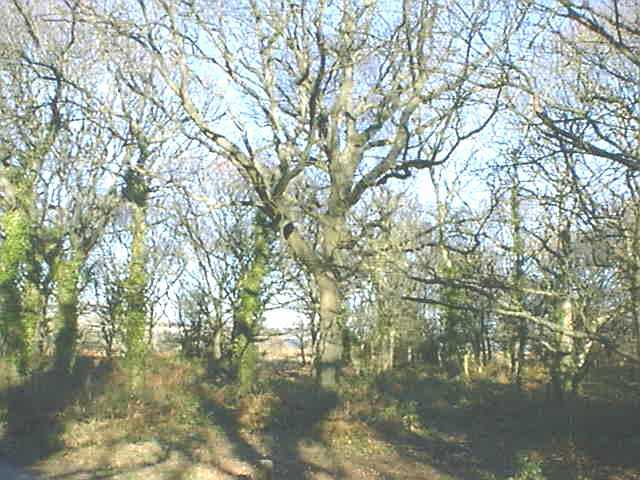 The archaeological and ecological importance of Hengistbury Head was formally recognised after a detailed archaeological survey (1915) conducted by archeologist Bushe-Fox. This survey was conducted as a direct result of the campaigning of a local historian named Herbert Druitt. Druitt had tirelessly sought to protect Hengistbury Head from the ravages of developers. Without his intervention the Head would have probably been a total loss. 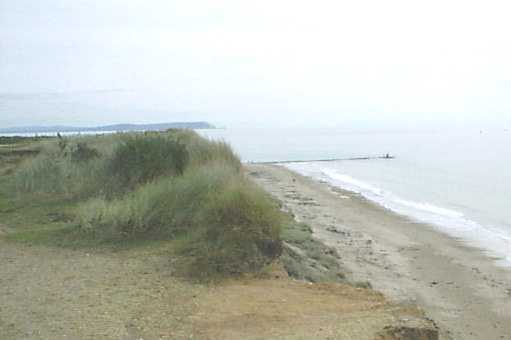 Hengistbury Head was purchased by Bournemouth Borough Council in 1930 from Gordon Selfridge. Selfridge had planned to build a mansion on the summit. At this time Hengistbury Head was suffering from catastrophic erosion, whether the rapid erosion caused Selfridge to abandon the development is unknown. Since then Hengistbury Head has been safe from the developers, although tourism has had a significant and detrimental effect upon the environment, especially where tourists have decided to leave the designated paths and scramble over the thin sandy escarpments. 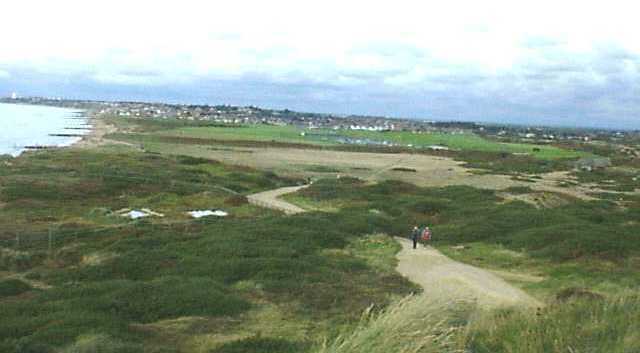 Many places on Hengistbury Head have crumbled and have been left denuded of vegetation. Hengistbury Head has been designated a Site of Special Scientific Interest (SSSI) along with most of Christchurch harbour and the lowland marshes of Stanpit that lie at the junction of the rivers Stour and Avon as they enter Christchurch harbour. Hengistbury Head is a beautiful timeless place. In the grand scheme of things Hengistbury Head is doomed to be washed into the sea, but the timescale of her final demise is very much in our hands. We are fortunate to be able to enjoy its windswept vista and admire the truly magnificent views across both Christchurch Harbour and out across the Solent. Try and treat her with care. Then maybe our great-great-grandchildren can enjoy this natural spectacle as we do today.